Looking for unique Kindergarden Activities, or School Field Trips? Monkeynastix will travel to your school!! Monkeynastix Burlington is a fun and challenging fitness movement education program developing physical literacy in children ages 1 to 12 years. Monkeynastix provides a fun and active alternative for your students! Focusing on developing children’s fundamental movement skills, Monkeynastix works on the long-term, physical, cognitive, and social development of children. Monkeynastix strives to develop confidence and a positive self-image in a fun and challenging environment. Using our specialized equipment and positive reinforcement Monkeynastix helps kids develop good habits in the area of physical activity and healthy living. Children leave Monkeynastix feeling happy, confident and energized! School Visits: Monkeynastix offers schools and/or day cares daytime sessions, before or after care program, PA day camp, and holiday programming. Our qualified instructors will come to your school and provide service on an hourly basis, so you can have all the children at your school or centre enjoy the benefits of physical activity. School Programming: Our physical literacy school programming allows schools and/or childcare centres to provide additional services to parents with busy lives. Monkeynastix gives schools the ultimate in flexibility. You choose the day and time for your weekly class, the number of weeks in your session and what age group you would like to offer the program to. By offering enhanced or extracurricular programming it gives parents comfort in knowing their child is getting their daily dose of exercise! Monkeynastix – Preschool & JK/SK Focusing on developing children’s fundamental movement skills, each class begins with a warm up which includes a fun energetic Monkeynastix song, stretching positions, fine motor activity and locomotion. Children then participate in a circuit featuring a main activity focusing on a particular theme such as balance, strength, floor skills, cardio, speed and agility etc. Each class ends with a manipulative activity focusing on a specific fundamental movement skill such as kicking, catching, throwing, dribbling etc. 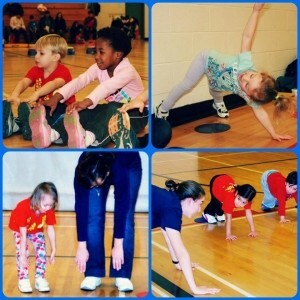 MonkeySPORT – Grades 1 to 6 Not sure which sports your students will enjoy? Get them in shape and sport ready with MonkeySPORT. Our 6-8 year old members will begin refining their fundamental movement skills by introducing them to the fundamental sport skills. While our 9-12 year old members will be working on refining the fundamental sport skills. Each class includes stretching, cardio, strength and a focus on one fundamental sport skill. Children practice their fundamental skills in well-structured drills and games with minimal focus on competition. Monkeynastix Instructors: Each Monkeynastix Instructor is fully qualified having completed our Monkeynastix Training Course and hold current CPR/First Aid, Police Clearance with vulnerable sector screening, and up to date immunizations.